Steve Cameron: Science Fiction & Fantasy Author: Vale: Johnny Winter. 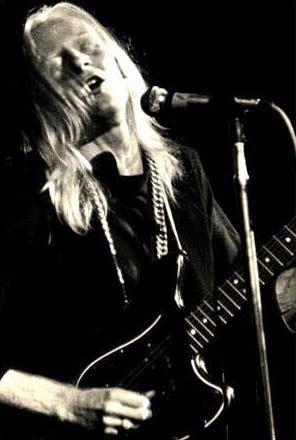 I was a teenager when Paul introduced me to the music of Johnny Winter. My friends were listening to the more popular music to be found on 3XY while Paul was playing Mountain, Ten Years After, Iggy Pop and Johnny Winter for me. I remember that raw voice, the 'I feel rock'n'roll' scream at the beginning of Johnny B. Goode, the guitar picking. I remember wondering why the band was called 'Johnny Winter And.' I wondered why the album cover showed only his back, and how this scrawny, weird looking, long haired white guy could play the blues so well. One of the first bootlegs I ever bought was a Johnny Winter live double album. It had a great sound, a tight band and a fantastic setlist. I played those discs so often I could recall every guitar lick in their grooves. I finally got to see Johnny live in 1986. I will never forget the moment he walked on stage. He asked how we were doin', played a few runs, then tore into Hideaway, and the band were off and running. Playing the licks so effortlessly, reaching for his Firebird when he played slide, that cool Texas drawl when he spoke to us. Johnny was on tour in Europe when he passed away. He has a new album due for release in the next few months. The Australian Spec-Fic Snapshot 2014. This Week, I'll Mostly Be Writing.